Our New York Jump Start is held in Pine Hill, NY, a secluded, rustic getaway amidst 23 unspoiled acres of mature pines, year round streams and natural wildlife. This and more make this location the perfect nature escape to reset your metabolism and accomplish your goals. Down time choices can be to cozy up near a fire place or find a comfy private area to nestle into with a good book.The grounds are peaceful, clean and contain all the modern conveniences you would expect from a getaway retreat . Visit the artsy historic town of Woodstock, go antique hunting or sight seeing the "Forever Wild Catskill Mountains Park Preserve". 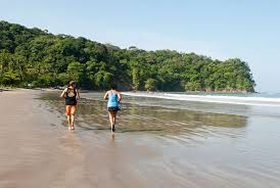 Our Costa Rica location is a beautiful and exotic Retreat experience. Our location is in the town of Playa Samara, a Blue Flag awarded beach. The area is surrounded by beautiful flowering plants, exotic birds and high above, howler monkeys remind us that we are nestled between the jungle and the beautiful Pacific Ocean. Samara is well known for it's safety and friendly people. The U.S. Dollar is accepted and most people speak English. When making travel plans to this location, call to speak to our travel experts for the fastest cheapest travel tips. All major cities now fly to LIR Airport, Liberia, Costa Rica. JUMP START GUESTS AGREE OVERWHELMINGLY THAT WE OFFER THE HIGHEST & HEALTHIEST WEIGHT LOSS AVAILABLE ANYWHERE - AND FAST! ​ TIME FOR YOU TO GET STARTED!